Endler's Livebearer Tropical Fish Learn all about the Endler's Livebearer's feeding habits and food types, its behaviour, its origins, its natural habitats, is it male or female, breeding advice and information, suitable tank mates, its sizing and growth range, minimum tank size, water PH and more. Use our fish community creator tool to plan your tank set up and ensure that the Endler's Livebearer is the right fish for your aquarium. The Endler's Livebearer is a very popular fish amongst many aquarists although its availability is sometimes limited in shops, leading to a large specialist breeders market. Endlers are very closely related to the guppy, and their appearance is very similar to that of the wild guppy, with males being small (about 2cm) and sporting bright patches of colour on the body, whilst females are larger (4cm) and plain. The colour patterns of males vary depending on the source and brood history although patches of bright orange, black, blue-green, and yellow-green are common. Wild strains have a dark band down the centre of the body and less variation of colour, but it is rare to see wild strains for sale. Almost all Endler's for sale are likely to have a small proportion of interbreeding with regular guppies at some point in their genetic history. Endler's have now been officially classified as an individual species, although they are so similar to guppies that interbreeding is possible, and viable offspring are produced. It is best to avoid keeping the two species together so that this does not happen. Endler's are easy to care for and relatively hardy and adaptable although they do prefer warmer water (20-28C) than wild type guppies and are fairly short lived, with a life-span of up to two years. Hard water is preferred, and since they are small, avoid larger tank mates. A very colourful and interesting fish, ideal for a community of small fishes. If you have a question about keeping Endler's Livebearer's then please use our Endler's Livebearer help forum. Join 100's of other fish enthusiasts with 1000's of years experience between them caring for and keeping fish like these. 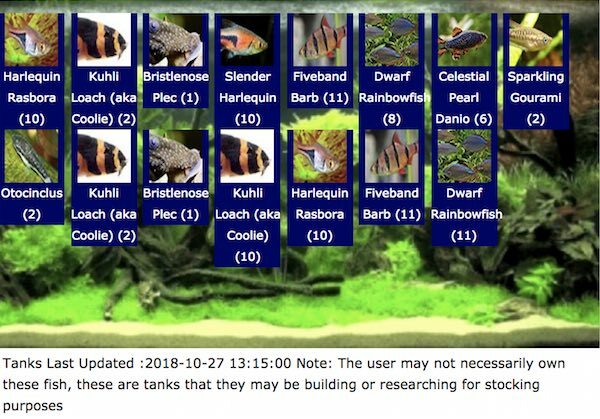 You are in the thinkfish community creator for the Endler's Livebearer fish species, you can learn all about how the tool works in assessing fish tank mate compatibility at the link provided or use the tool tips provided to guide you. Create a test fish community that includes the Endler's Livebearer species and any other types of fish or crustacean you'd like to introduce - You can assess the best companions, tank size suitability, stocking levels based on filter type and volume and possible negative interactions and warnings as you build up your aquarium. Please do check your water type for compatibility with your fish, which can be found on the Endler's Livebearer information box above and your local water company providers website. Don't waste your money and endanger your fish! If you'd like to talk about the "Endler's Livebearer" with our users, then we have a buzzing community of fish enthusiasts where you can talk about tank issues, Endler's Livebearer fish behaviour, Endler's Livebearer tank stocking and any other issues related to the Endler's Livebearer fish or other types you may have.